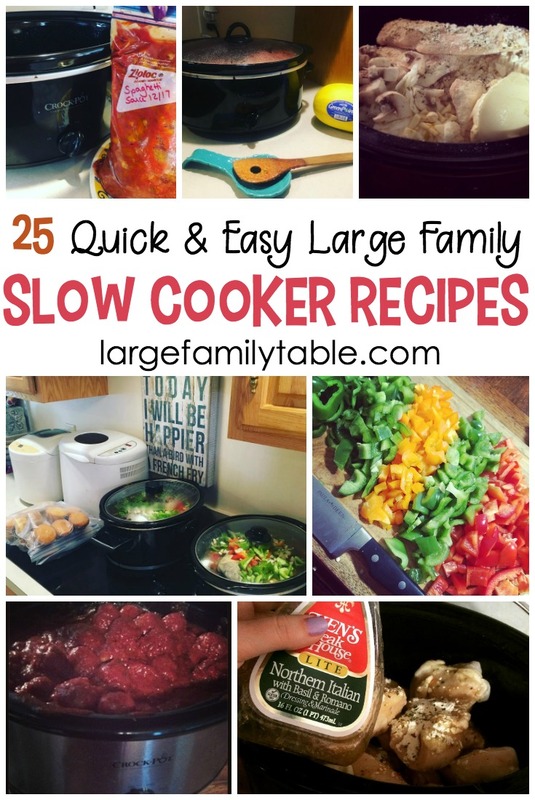 Whether you’re looking for an easy meal to throw in the slow cooker on a busy day for your large family or you want to start your day with a hearty breakfast, these quick and cheap large family slow cooker recipes are sure to be a hit at your large family table! Tender and juicy roast with brown rice is a crowd pleaser every time I make it. If you have two slow cooker (one for the roast and one for the rice), it’ll be even easier to make this Steak Roast and Brown Rice. This Garlic & Lemon Chicken recipe makes enough for four dinners! It’s super healthy and low-carb friendly. You’ll feel like you’ve gone out to dinner when your family dines on this easy Slow Cooker Chicken Teriyaki Freezer Meal. Your family will enjoy this batch of Cream Ranch Pork Chops. It goes well with vegetables, salad, and bread. Does your family love Broccoli and Beef? If so, this recipe is for you! It’s easy to make, goes great with a side of rice, and can be prepared as a freezer meal if you like preparing meals ahead of time. When I make this Philly Cheese Steak recipe, I use whatever type of beef roast I can get. That means you can use whichever meat best fits your budget and your family’s taste. By making taco meat in the slow cooker, we can use it to make tacos, nachos, or taco salad. There are so many ways to use this meat, we don’t feel as if we’re eating the same thing over and over again. Make this recipe for Bacon Parmesan Garlic Chicken and Red Potatoes, and your house will smell divine as it cooks. It’s not difficult to serve your large family a delicious meal even if you’re gone all day. Try some Pork Ragu Over Fettuccine for a delicious slow cooker Italian meal. This hot and cheese Slow Cooker Lasagna is the perfect large family meal. Pair it with easy sides – like carrot sticks and apple slices – for a dinner that is sure to please your crowd. This recipe couldn’t be any easier! Make your house smell delicious while you cook some Chicken Parmesan in your slow cooker. Pulled Chicken BBQ is a great recipe to make when there’s not a lot of time for meal-prepping. It’s not hard to make a batch of homemade cream of chicken soup. Use it as the base for homemade Chicken Pot Pie in the slow cooker. The beauty of this Slow Cooker Cabbage Soup recipe is that you can’t really go wrong with it. When I make this Slow Cooker Italian Chicken recipe, the whole family comments on how good the house smells. Did you know you can make meatloaf in a slow cooker? You can! It’s easy, and it’s healthy. Make one for dinner, and put one in the freezer for another night. This Slow Cooker Chicken Broccoli Alfredo recipe is hearty for the family and super easy to throw together on a busy day. This recipe for Easy Chicken Fajitas is literally a “dump and go” kind of recipe. Try some Slow Cooker Macaroni Hamburger Soup. It’s sure to make everyone at the dinner table happy! Crockpot Calico Beans are great for when you’re gone all day and need a hot dinner to come home to. This recipe is easy to double for large families. Slow Cooker Honey Garlic Chicken and Veggies is the easiest one pot recipe. 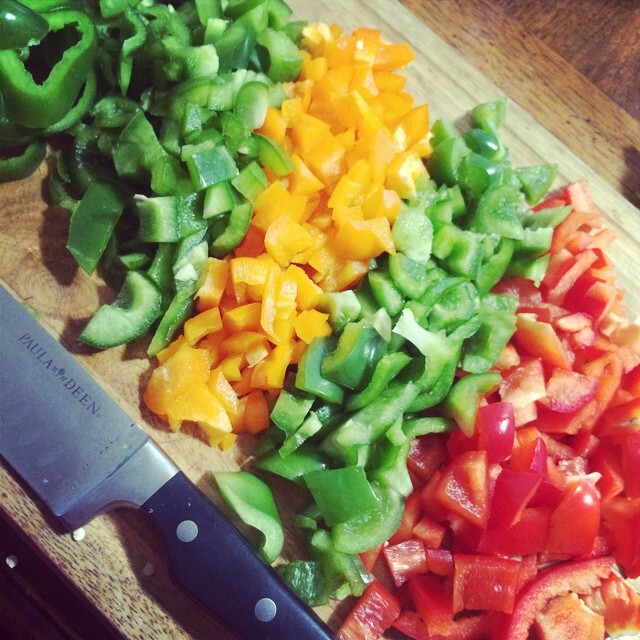 Simply throw everything in, and let it cook. That’s it! Here’s a super simple homemade Old-Fashioned Vegetable Beef Soup recipe that will feed your large family and may even make enough to freeze! Wrap up your busy day with an easy Slow Cooker Cherry Dump Cake for dessert! Here you can find 16 Easy, Cheap Slow Cooker Recipes For Large Families including Easy Crock Pot Turkey Chili, Slow Cooker Breakfast Casseroles, and many more! 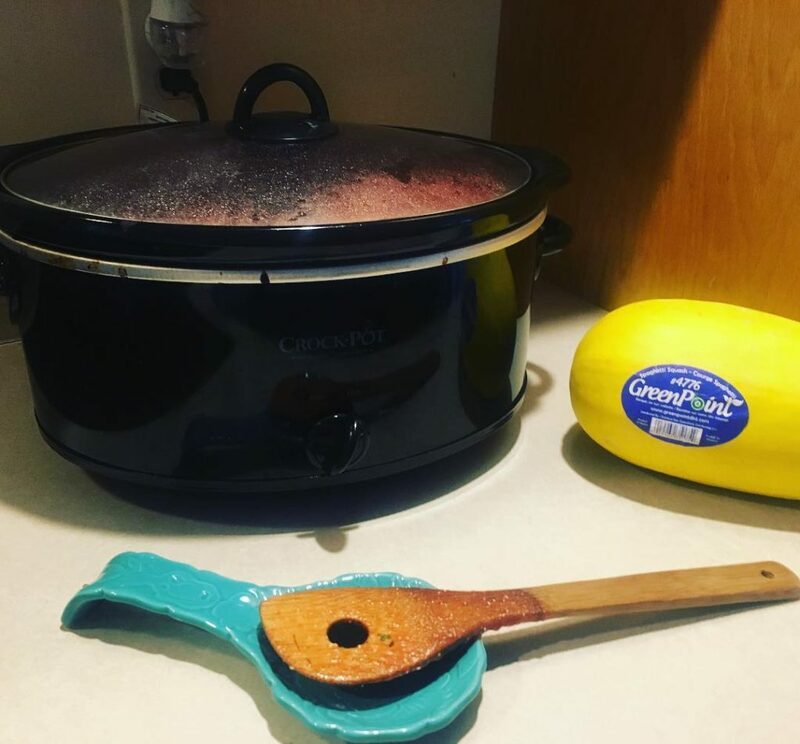 And the ladies over on Thriving Home share 25 Delicious Slow Cooker Recipes That Feed a Crowd featuring Crock Pot Cran-Apple Sauce, Herb Roasted Pork Tenderloin, and these slow cooker favorites. 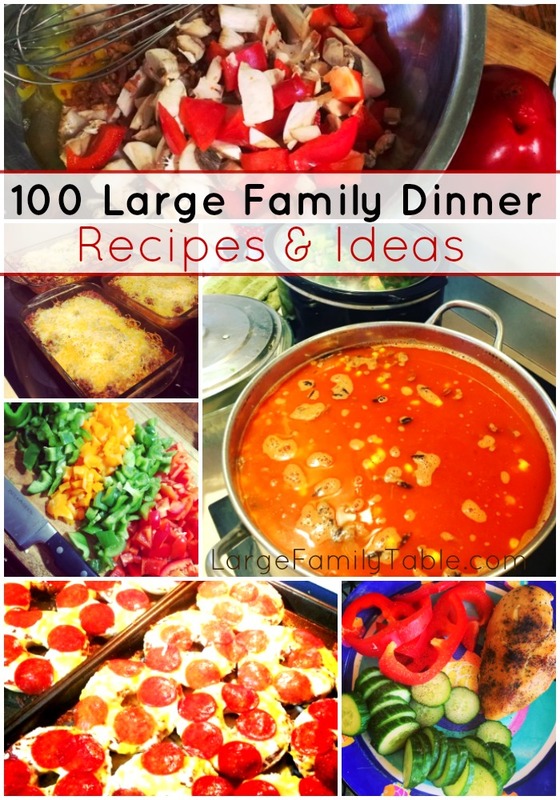 If you’d like even more ideas here are 100 Large Family Dinner Recipes to help feed your crew! 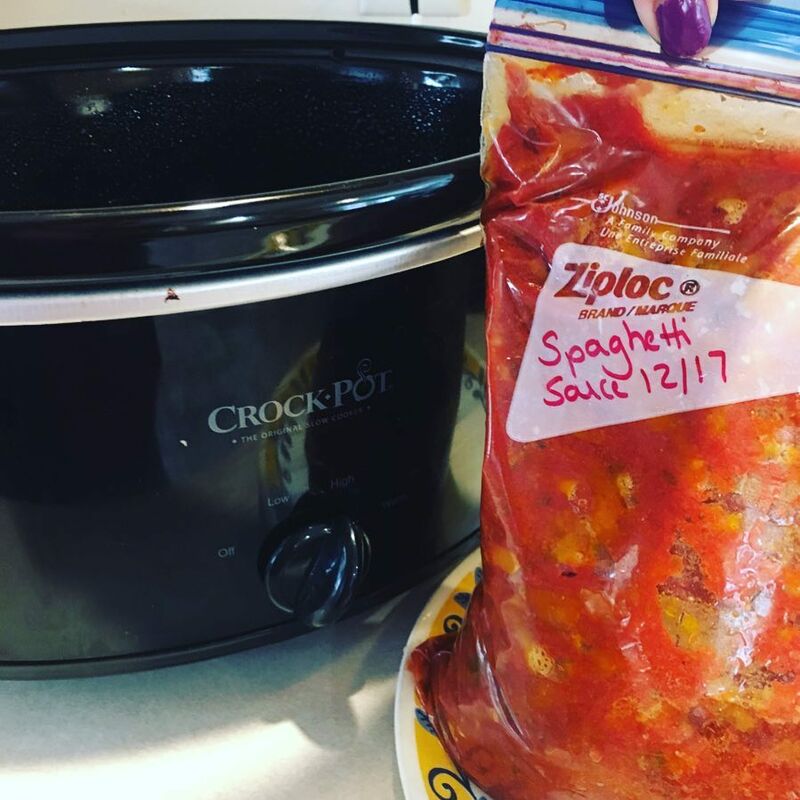 In addition to large family slow cooker meals, I also share a bunch of my large family freezer cooking days. I have two such days coming up later this week. 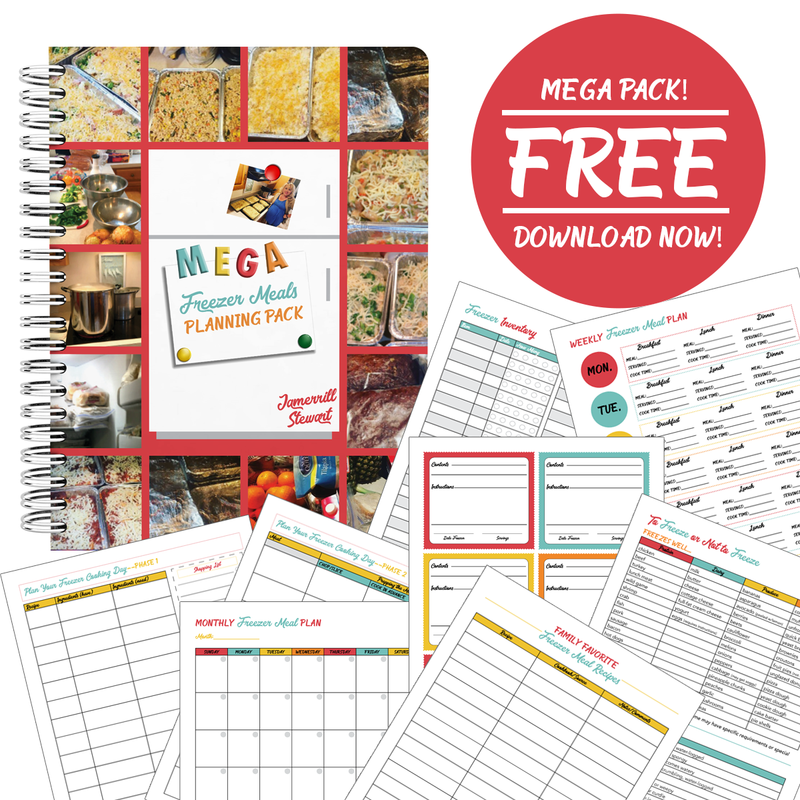 If you haven’t yet be sure to get my free Mega Freezer Meals planning pack right here. 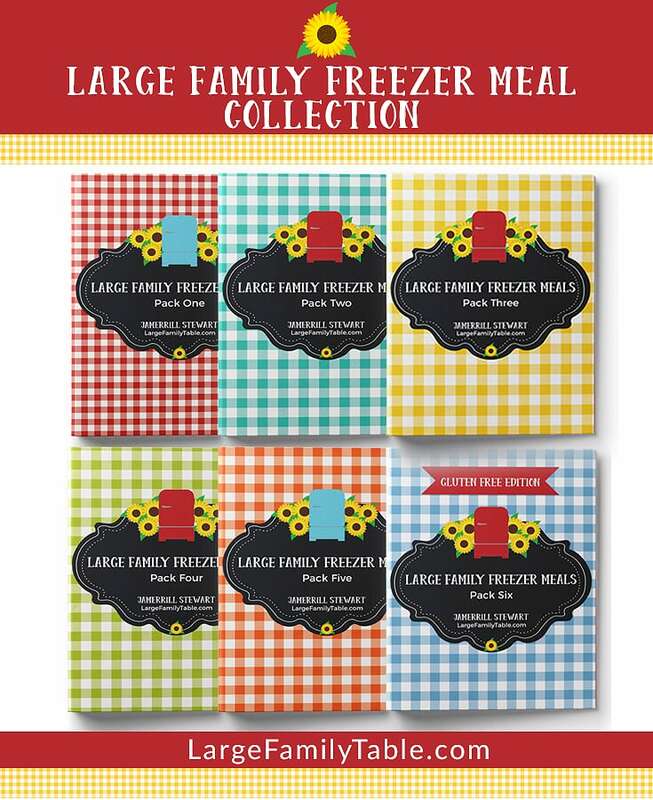 Grab your Mega Freezer Meals Planning Pack! 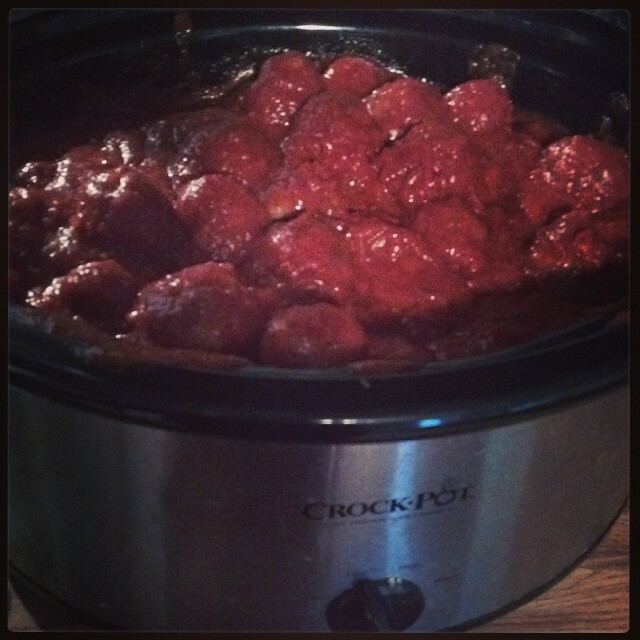 Be sure to share your favorite large family slow cooker recipes in the comments below. I love to hear from you!